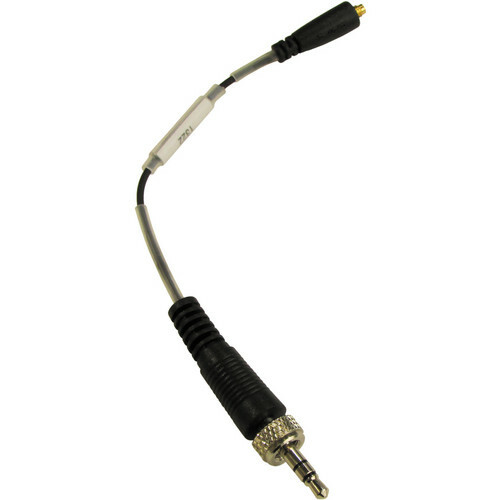 The Interchangeable 3.5mm Locking X-Connector from Point Source Audio is designed to fit Sennheiser EW series microphones. Box Dimensions (LxWxH) 6.0 x 0.1 x 0.1"
Interchangeable 3.5mm Locking X-Connector for Sennheiser EW Series Microphones is rated 5.0 out of 5 by 1. Rated 5 out of 5 by kevin from Works! This X-Connector does what it's supposed to do. Thanks Point Source Audio for this connector, we went from Shure body packs to Sennheiser body packs. This is also good for taking your microphone to other venues and plug into other systems with the different X-Connectors for different brand wireless systems. I do wish there wasn't a chance to over tighten but Point Source Audio does warn on the connector to not over tighten. I want to use my Sennheiser mics on my zoom N1. Because of the threaded collar, it doesn't fit perfectly into my Zoom N1. Does this cable convert the Sennheiser connector to a regular 3.5mm plug? This adapter is specifically for Point Source mics to connect into Sennheiser wireless bodypack transmitters.